Frames are used to protect, aid in hanging or displaying, and provide a finished appearance to a piece of artwork. Frames should be used to enhance the artwork, not overwhem it. I don’t suggest using glass for oil paintings, as oils need to breath. You probably want it to fit your decor, so go from there, whether casual, formal, rustic, or contemporary, etc. Bring the painting with you, pictures of the location to be hung, and try many options. • Formal and Traditional Frames are usually ornate and are a good choice for making a statement. These frames help to draw the eye to the artwork, but, if not carefully selected, they can overwhelm the art. • The larger the art, the wider the frame. But sometimes a wide frame on a small painting can make it appear larger and more expensive, and sometimes a narrow frame can work on larger art, giving it a contemporary look. • Color should be fairly neutral, but compliment the colors in the painting. For example, a dark brown wood frame could work well if the pet’s eyes are that color. Try To Get: “Open Back Frames” are meant to be hung on the wall and are sold as just the frame face. They don’t have backing material, glazing material, or hanging hardware. 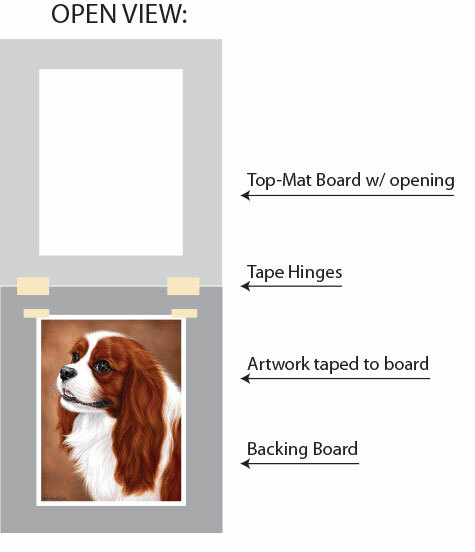 Open back frames are commonly used for traditional profile stretched canvases, and are deeper to fit. Frame Depth: The depth of a frame refers to the depth of the frame’s rabbet (the cut-out area behind the frame’s molding that holds the artwork in place). To find a frame that will accommodate your artwork, try to get a frame with a depth that is, at a minimum, the same as that measured depth. So, for example, the area on the sketch above has a 3/8″ is the area the canvas fits into. Most canvas is 3/4″ deep, but sometimes pre-made frames aren’t that deep, and that’s usually OK, unless you view it from the side. Viewed from the front, you don’t see the extra canvas. Attach the canvas to the frame. You can use hardware, like an L-bracket, or clips. Then, you can get many different hanging kits; I usually use screw eyes, and wire. Sawtooth hangers are easy, as well. For framing, make sure everything is archival (acid free); there is space between the glass (preferably UV blocking) and art, either with a mat, or spacers; they don’t drymount the art or use glue or regular tape (linen tape, “Artist’s Tape, Photographer’s Tape” are best, scotch tape or masking tape will dry out and crack); they don’t use fixative on the art; and they install a dust cover on the back. A good frame shop should use these techniques. 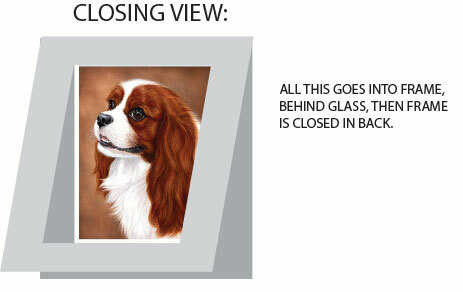 To frame it yourself, follow the above tips for best results, but you can just buy a pre-matted frame that includes glass and a backing board, and replace the standard glass with UV blocking from any glass shop if desired. If not exposed to much light, the regular glass included is OK.
To do it yourself, the easiest way is to put a couple of pieces of tape on the backs of the top corners of the art, facing up. Then place mat over art, so that it is centered, and press corners. Then you can flip it over, and tape the other corners, making sure the art is not loose. Then tape all edges. Put the mat back in the frame behind the glass, attach the backing board, and that’s it. — It is important that the art not touch the glass when done, so a mat is the easiest way to do that. — Don’t use Plexiglass, as it attracts the pastel particles. — Be careful when handling the pastels, as they can smear. Conte and graphite smear less than pastels. For YouTube video on the subject, click here.